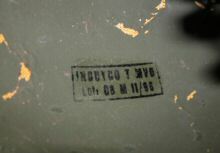 Induyco label in this example. 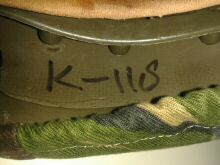 as issued to Netherlands forces. 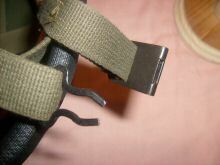 Chinstrap - right fastening - note typical Dutch 'arrowhead' insert. 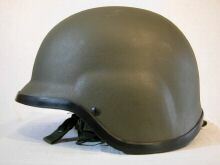 "The black stamp and the INDUYCO moulding in the liner strut may be specific to helmets produced for the Netherlands. 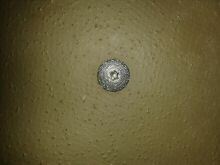 Not so far seen in German Induyco 826 examples." 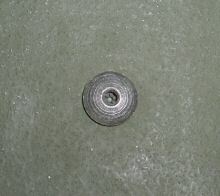 INDUYCO-MVD moulding in plastic of liner, at rear. 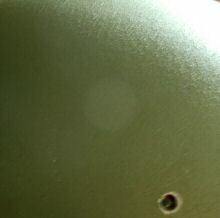 Dutch shell has a distinctly granular, sandy, finish, and is a lighter brighter 'apple' green than for example the German shells. 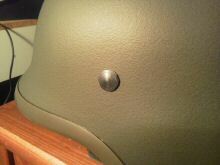 "This helmet was brand new, had no usage, and there was also a users manual with it and a 2010 cover in plastic . 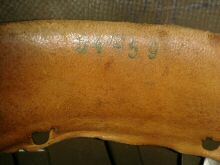 It has markings on one side - R 3/13, and a BO number 87213106611. 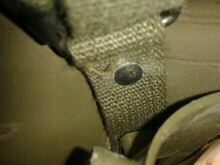 It has an Induyco MVD stamp which is normal - LOT M 06/96." 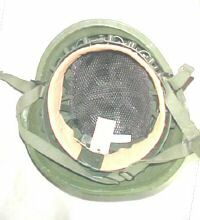 "The man that I bought this from told me there was a test with these helmets middle of the 90s with the LMB (Dutch air mobile brigade) . 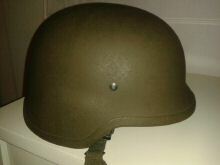 He told me also that the helmets are marked on the inside with a number that doesn't go above number 150 , indicating there where only 150 in test use at that time. 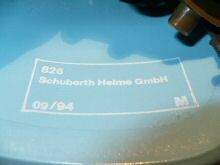 The Helmet is identical to the Dutch Schubert UN helmet only it's green and there is a Schubert Stamp in there with no Gr or other number - only says Schuberth GMBH . 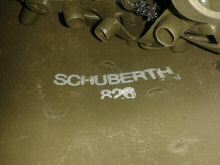 "Here we have a Schuberth 826 for the Dutch army in UN paint. 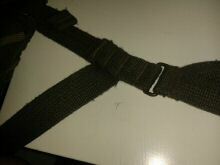 It is an official sample from "Afdeling Persoonsgebonden Uitrusting" ("Detachment for Personal Equipment"). 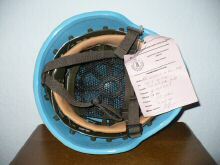 The label is fixed on the helmet with a wire and a seal. 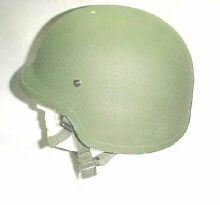 The label bears the marking 30 Sept 1994, the helmet is marked with 09/94. 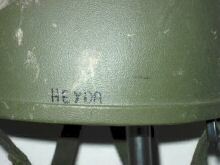 "This unusual object is actually an Austrian design (made of a Dynameena composite) tested by the Dutch in the 1990s." Notice how the top layer has begun to shale off. 'Delamination' in compo-speak. The interior is clearly unfinished. 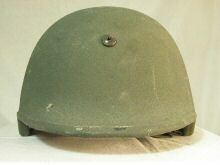 Liner very similar to Austrian Stahlhelm 1. 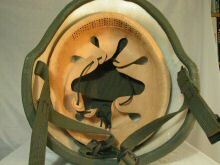 Austrian test helmet, showing that the typical Dutch arrowhead chinstrap fastening was used. 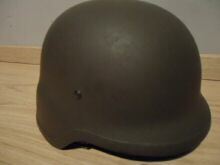 "Marzetti Third Edition 7.26 actually shows two separate helmets. 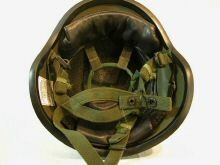 The exterior shot shows a steel clad Dyneema helmet, its interior, however, has the leather suspension and the chin-strap of the Austrian Helm 2 (M.75). 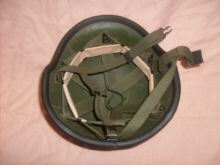 It has label in German "VERBUNDHELM mit 18 Lagen Dyneema Gewebe innen und mit OBH Innenausstattung" under which roughly translates as" Composite Helmet, with 18 layers of Dyneema weave inside and with the Austrian Army liner" It also has a Canadian Forces property tag marked "Austrian metallic airborne helmet X90-2403"
The interior shot is of another helmet same shape and made only of composite, its only marking is X90-2402 - as the picture in 7.26 shows it has a Riddel type suspension but a standard Austrian chin-strap. 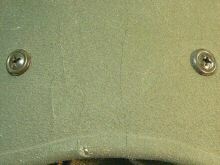 Both these helmets were discarded (and rescued), when the Canadian Forces Land Engineering and Test establishment closed down. 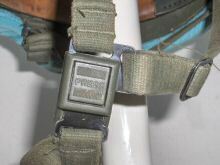 Their serial numbers show they were acquired by LETE for test and evaluation in 1990. 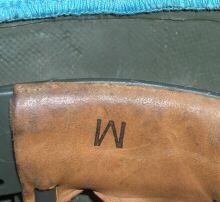 Obviously Austria adopted neither design, instead buying a version of the Gallet TC-3. 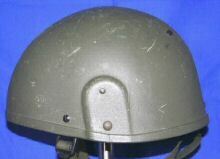 The helmet in 56.2 is exactly the same as number 1 here, it is fact made only of a woven composite (not steel-clad) which like numner 1 has not been painted over inside, and has an Austrian M.75 type lining and a 3 point chin-strap with a Dutch catch. 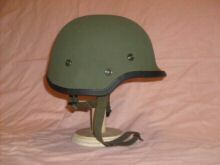 As we know the type was not adopted by the Netherlands which opted for the Schuberth 826. 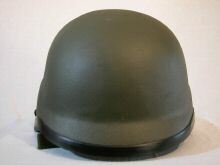 My guess is the helmet was made in Austria, given its liner and its similarity to the two 1990 Austrian trials helmets (same shape, even the same paint) , but I have nothing more concrete to go on." 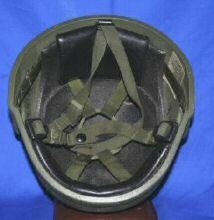 Compare this fully finished interior with that of the helmet shown in previous section. 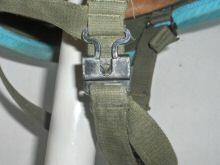 Typical Dutch 'arrowhead' chinstrap fastener. 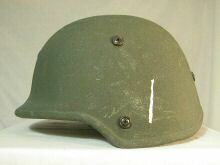 See also previous helmet on this page for more information. 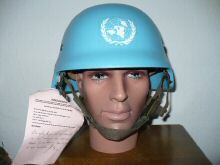 Exactly the same as the UK general service issue, but worth including as little is known about any use of these helmets in other nations. 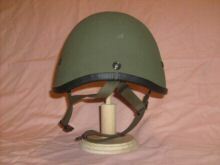 "This helmet was used in the early nineties as an experiment, by the Royal Netherlands Marine Corps. 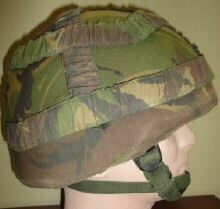 Since the RNLMC and the UK Marines do train together and are cooperating on a regular base, the Dutch MoD decided to see whether the British helmet might be suitable. It was rejected. 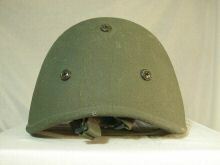 This particular helmet saw service in Northern Iraq in 1991 during operation "Safe Haven". 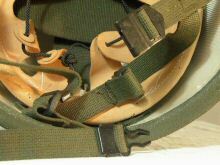 They were used with the original UK DPM cover and the Dutch variant. 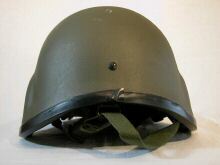 As you can see this helmet was worn by a Sergeant Blink and a Lieutenant Heyda. 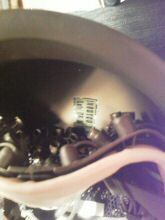 The latter I contacted and he gave me the info. 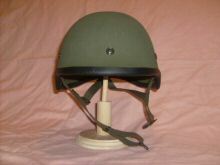 The helmet I bought from Sgt Blink's ex father in law. 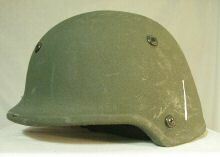 Quite a story for a common helmet." 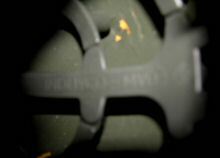 VINCENT IVENS points out - "It says in the text that it was used in 1991, but it has a second type M95 Cover witch was issued in 1996." . 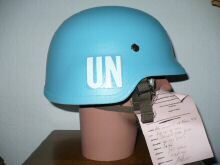 NP AEROSPACE helmet for the Netherlands. 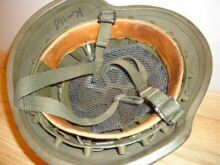 "An unusual item which has the liner and chinstrap of a UK GS Mk6 fitted into what appears at first glance to be a Gallet F2 shell. Apparently these were trialled by the Netherlands in the 1990s. Can anyone explain or add more information?" 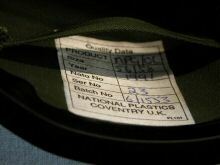 Product code on the label reads 'NP9 (or 'G')/OC' and is dated 1991.